Welcome to Day #21 of South American Chocolate Theme Weeks. This month we've been taking an edible tour of this great continent, filled with cacao-growing regions that date back to the origin of cacao. 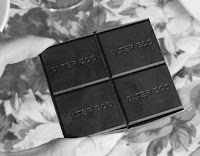 Before moving on from Ecuador to Peru, we'll taste two more bars made from Ecuadorean cacao. Drawing this pair of black aces from the depths of the Chocolate Banquet vault would be considered lucky by anyone with a superstitious chocolate bone in their body. And if it isn't considered so, it should be. 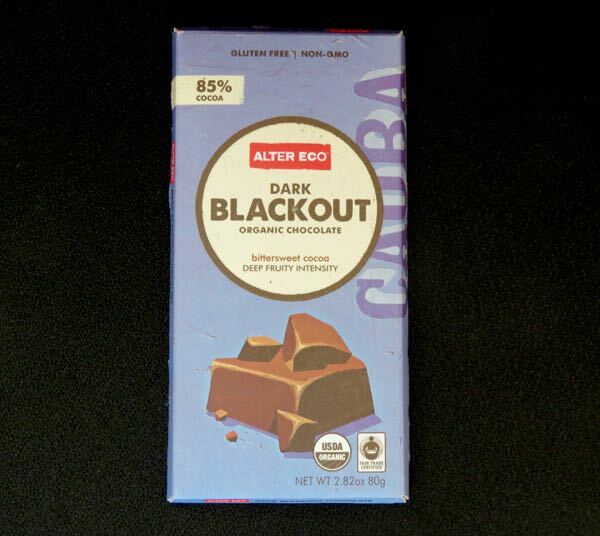 The 85% Cocoa Dark Blackout bar from Alter Eco (San Francisco, CA) was made from organic, fair trade cocoa grown on the coast of Ecuador. 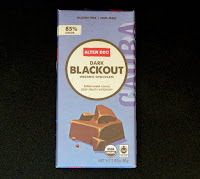 The resulting (gluten-free) ultra-dark bar had complex aroma with notes that included: true dark chocolate (fudge brownie), chocolate covered dried fruits, and a trace of smoked salt. The chocolate had a creamy, cocoa buttery melt, and a uniform, satisfying deep chocolate flavor with occasional light berry jam notes. Last, but not least, it was devilishly light on sugar. 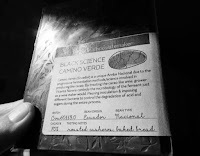 The 70% Black Science Camino Verde (Ecuador) bar had an aroma with lush green forest and bittersweet chocolate notes. 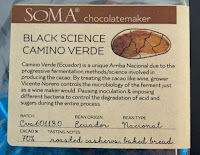 Tasting notes read: "roasted cashews (and) baked bread." The latter did show up a bit in the tasting arc, perhaps aided by a higher sugar percentage content (70%) vs. the ebony-colored 80%+ bars we've been tasting this week. The cashew was a more subtle, a difficult note to catch. If this bar did have a light sweet nutty note, cashews would be the right nut to describe that. 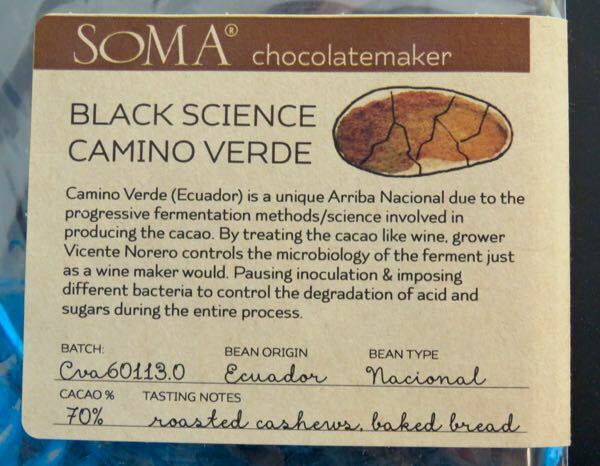 The "Black Science" term should be a tribute to the the farm, the fermentation expert (Vicente Norero), and the makers at SOMA Chocolatemaker (Toronto, ON, Canada). Chocolate-making is both artful skill and science. Successful chocolate demands both.